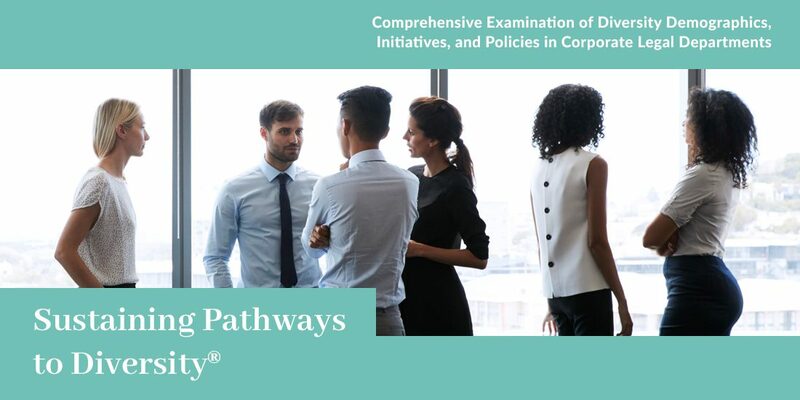 The Minority Corporate Counsel Association (MCCA) and the NALP Foundation for Law Career Research and Education are proud to provide our new benchmark research spotlighting diversity demographics within corporate legal departments across various industries: Sustaining Pathways to Diversity® Comprehensive Examination of Diversity Demographics, Initiatives, and Policies in Corporate Legal Departments. This important and timely study examines specific programs, efforts and initiatives undertaken by these companies to support and promote diversity and inclusion throughout the legal profession. This research is the continuation of a project which began in 2010 and seeks to provide a new perspective on diversity and inclusion in the profession by examining and documenting efforts within the legal departments of corporations throughout the United States. The current study contains data on diversity metrics inside these legal departments including the percentage of diverse individuals who hold the top legal officer and “direct report” positions. The study explores the structures, administration and scopes of diversity and inclusion programs, special outreach efforts and collaborative initiatives of the participating companies. It also examines how these legal departments measure and track the diversity demographics and progress of their outside counsel law firms. While it is clear that there is much more to be done to improve and support a more diverse legal profession, we believe this study and the results are an essential step toward identifying and highlighting the actions being taken and the progress made by corporate America. The complete 2017 research report is available only to MCCA members. To request the full research report please email membership@mcca.com for your member portal login. To inquire about MCCA membership please email membership@mcca.com.